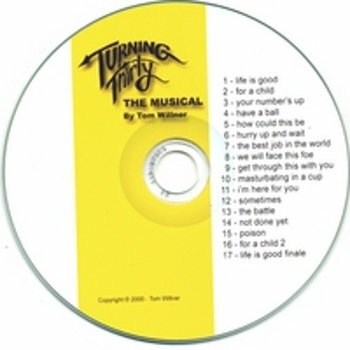 This CD is a collection of 17 songs about Tom Willner's experience with cancer. These are the original versions, both raw and creative, recorded while undergoing cancer treatments. The story begins on the thirtieth birthday of the main character, Conlan. He enjoys his work. He and his wife are thinking of starting a family. However, an unexpected and unwelcome visitor arrives to change their lives forever. Conlan learns that he has testicular cancer and must go through several operations to battle it. His cancer is personified as T.C., a character who sees himself differently than one might expect. Turning Thirty The Musical explores the needed surgical procedures and medical tests, the support of family and friends, and even the humorous side of the struggle, through song.